Shear has badly damaged Ike and we believe it is now 110-115 mph. The 5 am advisory from NHC had it at 125 mph. 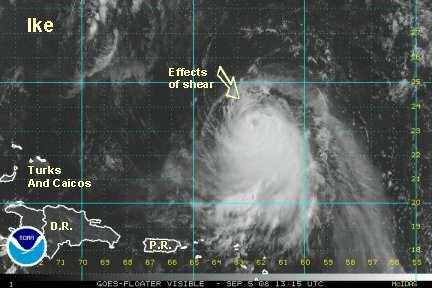 Notherly shear has damaged the circulation and will weaken it more. The forecast tracks are farther south. The models are shifting to take it over Cuba then into the Gulf. A few a still a little farther north into the Bahamas and south Florida. Remember the track forecast will change, so don't zone in on a location 5 days out. The strength will change too. After weakening, Ike may come back into more favorable strengthening conditions. Let hope the shear continues to weaken it! The latest satellite imagery continues to show the effects of northerly wind shear. Ike has weakened and our best estimate is 95 mph. A recon finally got into Ike about 3 pm edt and found a surface wind of 86 mph and a flight level wind of 108 mph. NHC's last advisory had Ike at 120 mph. For some reason they like to go closer to flight level winds (which are too strong for a surface estimate). Our guess is that they will go 105 or 110 mph on the 5 pm advisory. The last time we talked about not fretting over the models becasue they are always wrong...it just depends just how much. The latest trend, including NHC's track is to take it into the Turks and Caicos, then Cuba, then into the Florida straits. One of the more persistent models this time takes it to the northwestern Gulf later into next week. ***update*** NHC at 5 pm officially has Ike at 115 mph based on some higher flight level winds. NHC has left like at 115 mph on the 8 pm advisory. We thought that the wind speed was lower than this at the 5 pm advisory. Over the past six hours, Ike's stellite presentation has improved as the upper trough that has been bringing wind shear is now lifting to the northeast. So, at this point 110-115 mph is probably close. Ike is now under control of a ridge farther to the north. We expect strengthening again as Ike will have a favorable enviroment aloft. It will pass over the same location that Hanna just visited only a few days ago. It now aims for the Turks and Caicos later tomorrow into tomorrow night. The models are coming into agreement on the next few days pushing it toward Cuba. Some take it straight down the spine of Cuba which would weaken it greatly if that happens. Other models take it just north of Cuba into the Florida straits which would allow Ike to maintain strength or continued development. The GFS takes Ike into the Gulf and recurves it toward Tampa next week. This model has been progressively moving west and so far not handling the stiuation well. The GFS was the lone outlyer a few days ago that said recurve it of the Bahamas. Obviously the GFS is not on track this time around....yet. The Euro has been stable and called for the Gulf track before ths others so that's what were siding with for now. The Euro has a northwestern Gulf track. At this point <b>we don't believe any of the runs beyond three days.</b> The track toward Cuba is probably ok at this point. Please be prepared in the Turks and Caicos, southern and central Bahamas, Cuba, and south Florida - especially the Keys. Ike's track even more south and west? On the last update we described how the models were trending west. 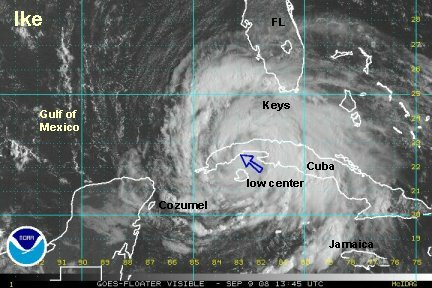 We'll, as we watch the satellite imagery, it appears to we moving southwest toward Cuba. As we mentioned, we thought the Euro had a good handle on the situation. That model takes it <i>south</i>of Cuba then into the Gulf ultimately to the central Texas coast later next week. So, even this model is trending west. We are also quite concerned that Haiti and the Dominican Republic are going to take a hit again. That would make the 4th round of deadly flooding from tropical cyclones this season. The other models are also trending west. The GFS on the last run took Ike into the Gulf to recurve it toward the northcentral Gulf coast. The prevoius run had recurving toward western Florida. Ike is still offically at 115 mph. It is still fighting shear and will likely strengthen before it (probably) hits Haiti and/or eastern Cuba. Please be prepared in the Turks and Caicos, southern and central Bahamas, Cuba, Hispaniola, and south Florida - especially the Keys. 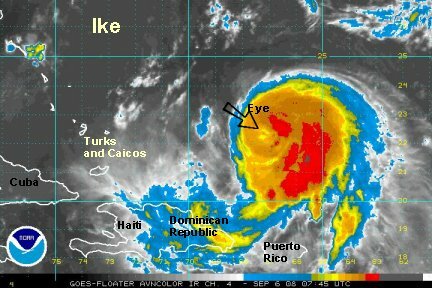 Ike is now east of the Turks and Caicos and north of the Dominican Republic. One of the bands is already affecting the Dominican Republic. Rain has begun in southern Haiti and should become more widespread today. It looks like they're in for another round of deadly flooding. The models are still split after Cuba. Most models take Ike over Cuba which will weaken it a lot if that scenario play out. The Euro, which we will evaluate when we get it late this afternoon had the south of Cuba and western Gulf track. Most of the other models had Ike recurving in the eastern Gulf. This forecast dilemma is all about the strength of the mid-level high and it's predicted strength. Remember not to get too reliant on the forecat that is several days out. It will be wrong to some degree. Ike has organized in intensity again today. That is very apparent by looking at the favorable outflow that has developed aloft. The Hurricane Hunters also found a 950 pressure earler on their last pass. Ike is again a very dangerous hurricane. It appears to be moving west southwest and should move over Cuba on this trajectory. If this is actually what happens, Ike will lose a lot of strength. 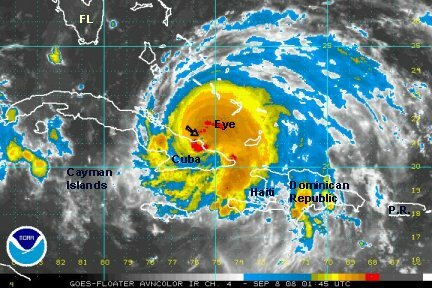 If you recall, western Cuba was the recipient of Gustav and weakened it greatly. If Ike can manage to stay offshore that would be very bad news for all, as it would keep most of its strength or actully strengthen if far enough away from land. 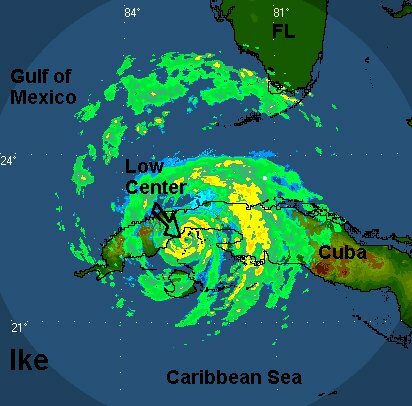 At this point, we think Ike will move over Cuba and weaken. EURO...Ike is going to move around the edge of the subtropical high. An upper air trough pulls Ike northward to the northern Gulf (offshore) by the middle of next week. The high builds back in and sends Ike to the western Gulf. Most other models....Ike will also move around the edge of the subtropical high. The mid latiitude trough is stronger and pulls Ike back to the northcentral or northeastern Gulf coast late in the week. It appears that the models are now feeling that the mid-level ridge in the middle of next week will stay strong. The models have trended west and take Hanna over Cuba then in to the central Gulf. The recurve toward the northeast Gulf is gone for now. The Euro stayed west and the models are converging on its solution this time. Even the GFS is farther west, although it still has a very ominous forecast of taking Ike in the exact location where Gusvtav moved inland on the coast of Louisiana. Ike is still looking more organized and the pressure from the recon has slowly dropped, now down to 947 mb. By this pressure measurement, we believe that Ike will be strengthened a bit more on the 11 pm edt NHC advisory. 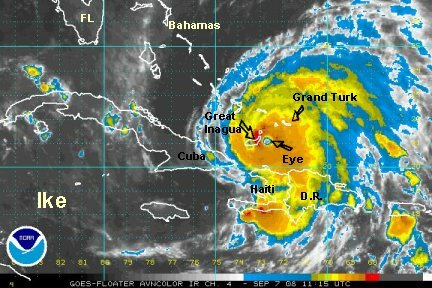 Grand Turk went through the eyewall of Ike last night. Apparently, significant damage occured. Details will be made available as damage assessment begins. Hispaniola has again taken another hit with heavy rain. 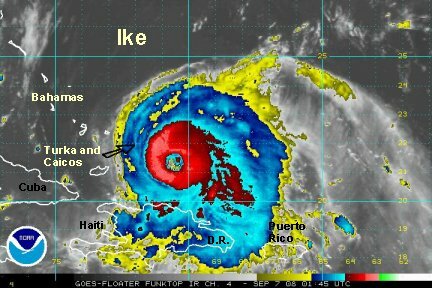 This makes the 4th round of flooding from a tropical cyclone this season.....Fay, Gustav, Hanna and now Ike. 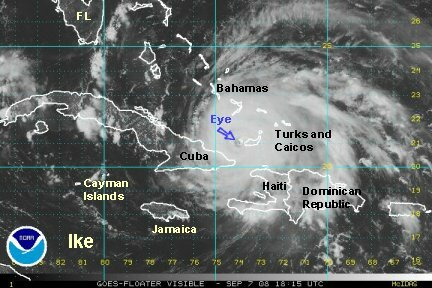 At tis point Great Inagua is in the eye of Ike. It does not appear that Ike is a strong as the official 135 mph dictates at this point. The eyewall is not nearly a thick, but the pressure is still down at 949 mb. That's a very low pressure. We think the wind may be closer to 125 mph, but won't be dogmatic about it because of the very low pressure. With Ike's proximinity to Hispaniola, no doubt, the low level wind flow is being blocked by Haiti and the Dominican Republics's high mountains at this time. 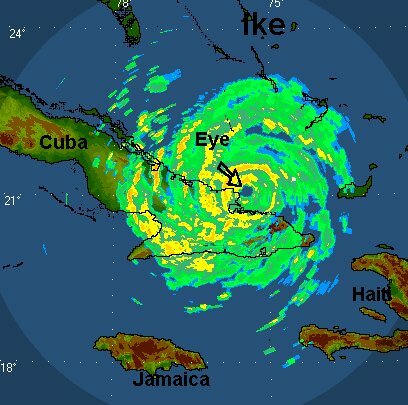 As Ike pulls away from Hispaniola, it may strengthen briefly before hitting Cuba. 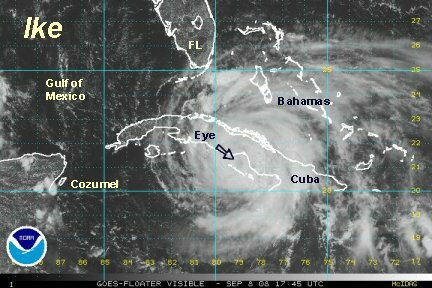 Southeastern Cuba is starting to get some effects now and landfall should occur by this evening. 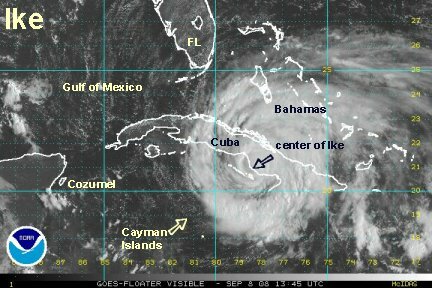 Ike's strength should go down a fair amount, it just depends if it takes the long or short route across Cuba. If Ike drops south into the Caribbean, it may weaken some then stabilize and strengthen again. If it moves down the spine of Cuba, it may drop all the way down to tropical storm strength. Because of this track to the south, Florida should fair pretty well. Miami southward still may get some squalls, especially the Keys. Don't let your guard down though. Keep an eye on the latest track! The models are converging farther west. The northwestern Gulf is where most models are going now. Some still try to recurve to Louisiana, others go into Texas. That's too far out to know for sure, just keep an eye on it. 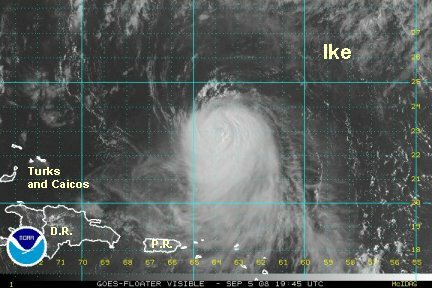 Ike made a direct hit on Great Inagua earlier this morning. It is now about six hours from the northeastern Cuban coast. Ike is moving west and has top sustained winds of 135 mph officially. We still think that it is somewhat lower. Pressure has not changed now for almost 24 hours. We are expecting substantial weakening as it moves over Cuba for the next day and a half. There have been not any important changes to the forecast. Ike will cross Cuba then move toward the middle Gulf. From there the models split from Louisiana to Texas. Ike made landfall at 9:50 pm edt at Punto De Sama in the province of Holguin. The estimated top sustained wind speed at landfall by NHC ws 125 mph. Pressure continuted to drop and was reported at 945 mb late this afternoon. It was probably lower at landfall. Ike, undoubtably will lose considerable strength over Cuba. How much will be determined how long Ike stays over land. The forecasts tracks have been staying on course. If anything, the track is slightly farther west. The range now is from central Louisiana to nearly south Texas by late this week. There's plenty of time to watch Ike before a U.S. landfall occurs. After a 12 hours stay over Cuba, Ike is moving back over water into the Caribbean Sea. Being over land has taken its toll on the strength of Ike. NHC's last official strength was 100 mph on the 11 am edt advisory. We believe it is weaker than that, probably closer to 85 mph. NHC just said they should have a better estimate when a Hurricanne Hunter can take a measurement. By that time, if Ike stays over water should start to restrengthen some. 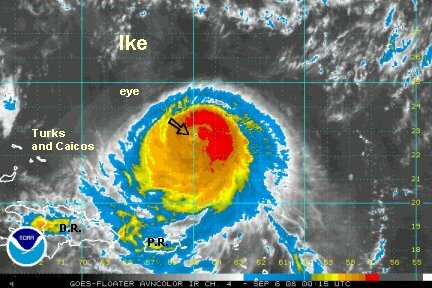 Ike should start making a slow wnw turn soon. 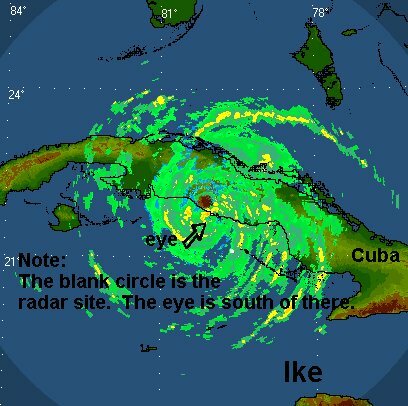 This will cause Ike to make its second landfall in Cuba. 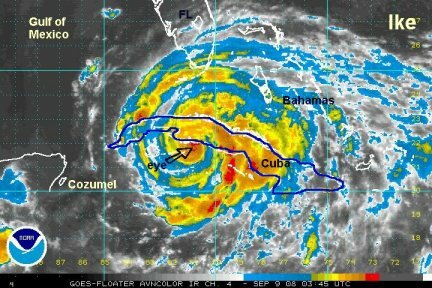 Unfortunately for Cuba, this will be in the zone that was ravaged by Gustav not long ago. If you recall, crops and houses were destroyed in this area of Cuba. This is also where the Cuban weaher service reported a wind gust to 211 mph. The forecast models still take Ike toward the northwestern Gulf of Mexico by the end of the week - maybe Friday/Saturday time frame. Ike should restrengthen, but we can't be sure how much. Ike moved off of the south Cuba coast just before noon today and continues west south of the coast. 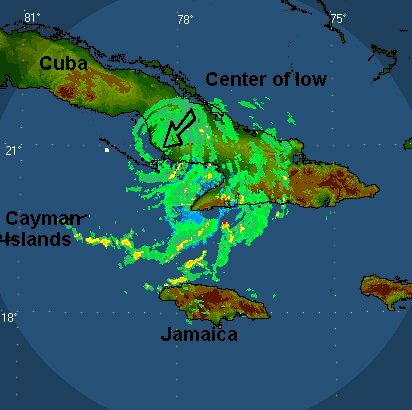 It will make another landfall on Cuba before heading into the southern Gulf by Tuesday evening. NHC has Ike still at 100 mph. We're not sure if they received the last recon before posting. The Hurricane Hunter reported a top surface wind of 74 mph. We don't think that they were able to sample the whole storm, but with a pressure 970 mb, it has to be considerably weaker. We'll stick close to our earlier estimate of 80 mph. Ike may strengthen some in the next 24 hours since it is over water, but with its proximity to land it shouldn't be a lot. Once Ike gets into the Gulf we're expecting strengthening. The forecasts tracks are a little west. It appears that Texas may be the landfall point of Ike, although were not ready to let Louisiana out of consideration yet. 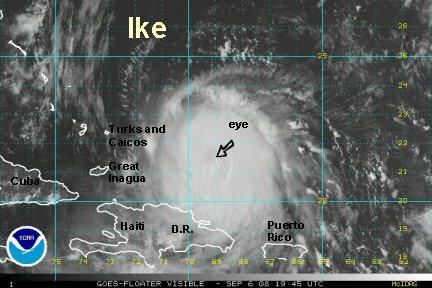 Ike is continuing west northwest along the south Cuban coast this evening. NHC has finally agreed with our strength assessment of earlier and has dropped the winds down to 80 mph. Don't look for any strengthening as long as it is straddling the coast. Significant strengthening may not occur until late Tuesday night or Wednesday when it moves back over water. There are a couple of rain bands moving through the Florida Straits that may affect the Keys. The forecast remains pointed at the western Gulf. The models now range from the Texas/Mexican border to Houston. The trend over the past three or four days has been farther west and south. 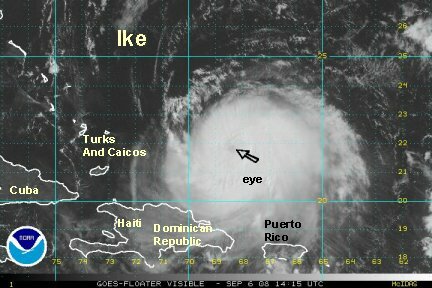 The latest satellite imagery shows that Ike is starting to organize again. 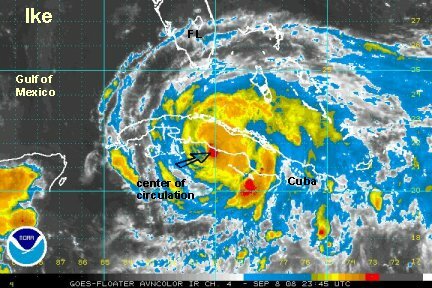 The center of circulation is just far enough offshore, south of Cuba, for regeneration to occur. 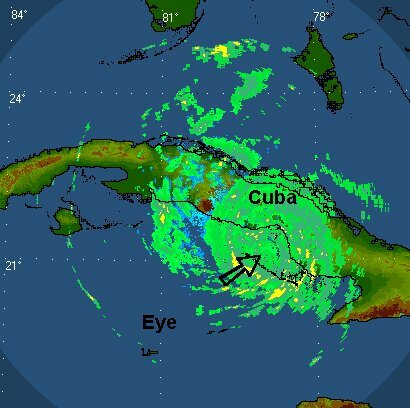 This will continue until sometime later Tuesday, when it makes lanfall again in western Cuba. This part of Cuba was hit by a powerful category 4 hurricane Gustav not very long ago. Some squalls have made it to south Florida, especially the middle and lower Keys. A tropical storm warning is in effect from Ocean Reef to the Dry Tortugas at this time. Ike will move into the Gulf of Mexico sometime later Tuesday. This is when it will make its true run at strengthening. The forecast models are still continuing the trend of farther west and south. One reliable model has it making landfall south of Brownsville, TX late on Friday. Remember, this is one model and still four days out. We are gaining more confidence that the track will be from the central Texas coast southward though. Still, all of the Texas coast needs to watch this hurricane closely. The right front quadrant will affect areas far to the north of the landfall. 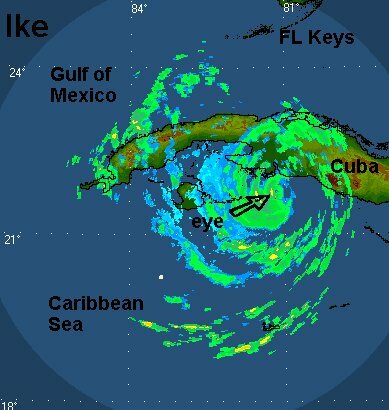 Ike made landfall in western Cuba at about 10 am edt essentially in the same location as Gustav did not long ago. Officially Ike is 80 mph and moving wnw 13 mph. We are finding the same dilemma as we did in Gustav. In Gustav the pressure indicated a much stronger tropical cyclone than what was being observed by the winds. In Ike, we're finding a pressure very indicative of a hurricane. The winds, for the exceptiion of a surface wind measured at 74 mph several hours ago, have been indicative of a tropical storm. Over the past few hours winds have been in the 60-70 mph range. So, with this being said, we don't agree with the official 80 mph assessment. Ike is probably closer to 65 mph <i>sustained</i>. Structurally, Ike is looking more organized and when it moves into the Gulf by mid-afternoon should start to intensify. The forecast tracks still take Ike to the western Gulf by late Friday or early Saturday. Most take it inland into south Texas or up to the central Texas coast. There has been one change with a few of the models - just before landfall, they recurve Ike quickly northward. This is something to watch carefully. This could mean that much more of the shoreline will get a landfall if this actually happens.